You really didn't think I was going to let that pass by without doing something fun, did you? 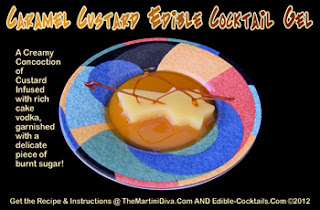 If you love caramelized custard here's a way you get to have it as a cocktail! This jello shot aka cocktail gel is smooth, creamy, rich and dripping in decadent burnt sugar and caramel sauce! Treat your friends to a truly unique dessert the next time they come over for dinner! Spray your cake pan mold and set aside. Mix the caramel sauce in with the cake vodka and set aside. Place the milk into your saucepan and sprinkle the Knox in, stir and allow to settle for a minute or two. Heat on low setting until the gelatin is completely dissolved, about 2 to 3 minutes or so. Set the gelatin milk mixture aside. In a separate bowl add the remaining 1 cup of milk and the pudding mix and beat for about 1 minute or until the pudding is completely incorporated. Add in the gelatin milk mixture, mix well. Immediately add the 1 cup of cake vodka/caramel sauce and mix for another minute. Pour into your greased cake pan and let set for at least an hour. Once your pudding gel has set up you are ready to cut out your shapes. Pour some caramel sauce into your serving dish then carefully place your Caramel Custard Cocktail Gel in the center and top off with your delicate burnt sugar garnish. Mix the sugar and water in a small saucepan and place on medium heat. Heat until the sugar is completely dissolved and starts to turn a light, golden caramel color (it will read 310 F on a candy thermometer). Remove immediately from the heat and allow to cool until the mixture thickly coats the back of a spoon but is dripping off in a continuous stream. Quickly dip the spoon into the molten sugar and start drizzling fun shapes onto your silpat or parchment lined baking sheet. Do the whole sheet as some will break or not be as pretty as you would like - this way you get to pick and choose! If the burnt sugar cools off too quick you can reheat it until it's molten again as long as you don't burn it - burnt sugar is very dark and very bitter!! Allow the shapes to cool and store in a very dry place until ready to garnish.